Not Too Late to Order Year-End Countdown Sale Banners! 2019 is almost here! Are you looking for a way to get rid of your old inventory and make room for new products? 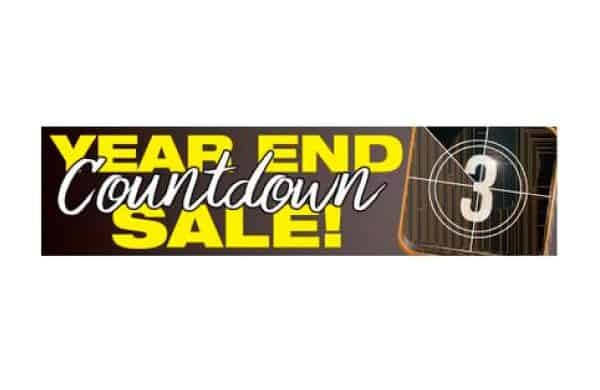 Our Year-End Countdown Sale banners can help your business get the job done. 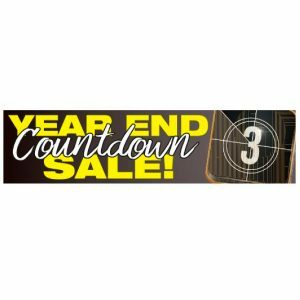 The Year-End Countdown Sale banners feature bright and vibrant yellow and white graphics centered on a clean-cut black background. The electric color theme will draw attention to your business so your customers know about your Year-End Sales Event! Our banners always make a statement. When you order our Year-End Countdown Sale banners, customers will flock towards your dealership and shop the amazing deals on 2018 inventory. Let Us Shake Up Your Showroom! Are you looking for a way to catch your customer’s attention? It’s not too late to order your car bows for the holidays! 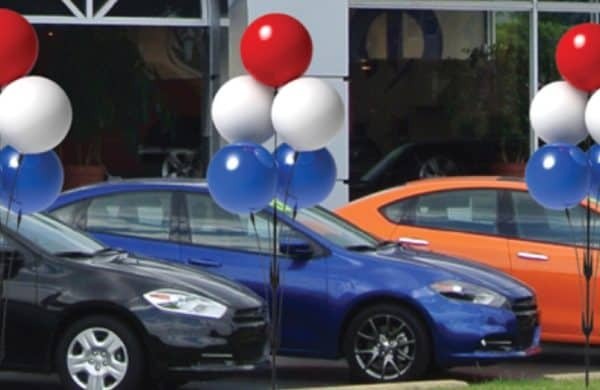 There is nothing that grabs more attention than an oversized bow placed on top of your inventory, in front of your business, or inside your dealership’s showroom. Our Giant Car Bows will draw attention without requiring much time or effort. These bows will shake up your showroom and take your decor to the next level. If you decide to display our bows on your vehicle inventory, they are compatible with all makes and models. The innovative scratch-proof design will never leave a mark on your vehicle or on any surface you display your bows on. These bows are hassle-free! The car bows are attached with a budge-proof soft magnetic base that will stay in place, even in the wind, rain, or snow. Each bow is crafted out of a high-quality weather resistant vinyl material. Even if it pours, your bows will look flawless. For the holidays, we recommend our vibrant red, green, silver, or gold bows! We take custom orders, so if you want to choose a color scheme that coincides with your branding, please notify us when you place your order. Why spend money on complicated decorations when you can steal the show with a car bow that is easy to install yet makes a lasting impression. Buy a pair of our car bows today for a bargain price! The perfect decoration for a brand-new car! This holiday season, if you plan on gifting your loved one something as extravagant and expensive as a car, we have the perfect decoration. Our Giant Car Bows will add the perfect finishing touch. 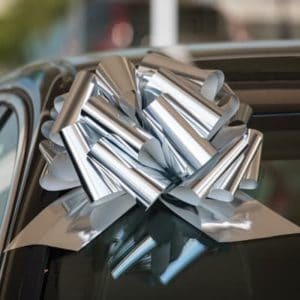 Giant Car Bows are perfect for decorating gifts that cannot be traditionally wrapped such as bicycles, ATVs, motorcycles, boats, and more. If you have a custom order, we can accommodate you! You have the option to customize your bows. Choose from different color combinations and material including velvet, plastic, and vinyl. 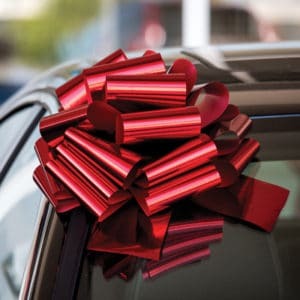 If you bought your loved one a bright red new car, choose a bright red bow to match! Our Giant Car Bows are compatible with all car models. The Giant Car Bows are easily assembled with a scratch resistant magnetic base that can be attached almost anywhere! Our Giant Car Bows aren’t just for the outdoors, they are designed for both indoor and outdoor usage. Our specially designed magnets keep the bows from blowing away in the wind, and the scratch-resistant bows will not scratch or damage your windshield or cause chips in your car’s paint. Hurry and order your Giant Car Bows now before they sell out! Our Giant Car Bows are a hot commodity this holiday season. Are you looking for a way to add something extra to your car dealership or retail store? Call us at (877) 424-4433 for special orders or orders over 20 sets of two (40 bows). Perfect for Embellishing Anything You Choose! Nothing looks more festive and decorative than a shiny red bow! Our car bows ship flat for your convenience. To activate your car bow, simply pull the string and watch it transform before your eyes. All it takes is a few seconds and you’ll have a fabulous yet easy decoration ready to be placed and displayed wherever you choose. Our car bows tie with a heavy-duty suction cup designed to be positioned on a vehicle windshield or other surfaces of your choice. The suction cup will not budge once it is placed, even in wind, rain, or snow. The exterior of our bows is crafted from a shiny, high-quality, weather resistant material that can be used indoors or outdoors. This particular bow is 12 inches in diameter with two 8-inch-long tails. 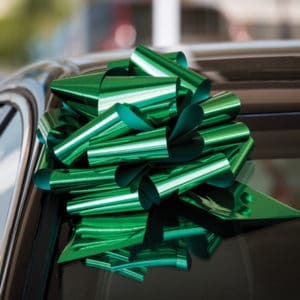 Place them on the windshield of a vehicle to highlight a price, year or vehicle feature, on a new product display, or on presents such as a kitchen appliance, a bike, or anything that cannot be traditionally wrapped. The versatile size of these bows allows them to be used on almost anything that needs to be emphasized with a big shiny bow! 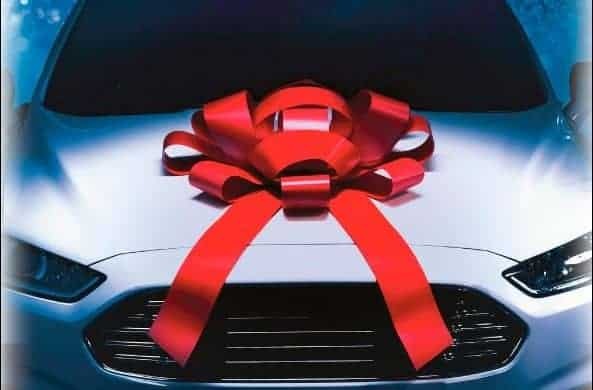 Use our car bows to decorate your showroom, your office cubicles or any space worthy of a beautiful bow! There is no better way to spread holiday cheer than with shiny decorations to help spread joy to your customers, friends, and family. Our car bows will get the job done. Put yourself in the holiday spirit and place your order today to get ahead and start decorating for the holiday season as soon as you can. Bring the holidays to your products! Deck the halls! 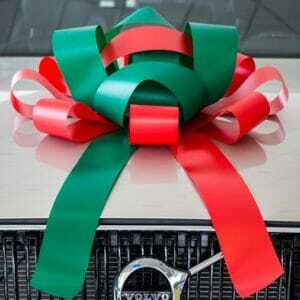 Get in the holiday spirit with our festive themed Giant Car Bows. Our bows can help you draw in more customers and drive your holiday sales forward. You can display our car bows throughout the holiday season. Our car bows are priced affordably to make sure you get your money’s worth! The Giant Car Bows come in red, green, silver, or custom colors. The choice is yours! We know that your customers will love them. You can also choose from a variety of finishes including a water-resistant vinyl and plush velvet. Our car bows are guaranteed to make a high impact and draw in more customers to your retail store. Your customers will appreciate the extra time spent decorating your store for the holidays. Small details matter! And who doesn’t enjoy beautiful themed decorations? Holiday-themed bows will keep your business looking festive for all of your customers. At Shake Up Your Showroom, it’s the most wonderful time of the year! Order our car bows online today. Are you looking for a way to add extra decoration to your car dealership or retail store? Call us at (877) 424-4433 for special orders or questions. Black Friday Decorations on Sale NOW! 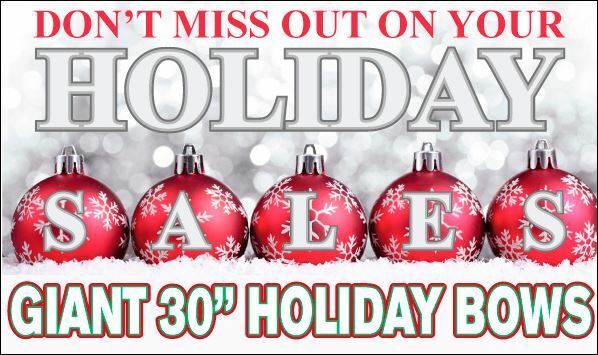 Don’t Miss Out on The Biggest Sales Event of the Year! Black Friday is only the biggest sales event of the entire year. Your business needs eye-catching decorations to stand out from other stores and make sure customers choose to shop your sales! The competition is fierce on Black Friday Weekend. Start preparing now and order your Black Friday decorations online today. Our Black Friday Promotional materials are perfect for advertising your special sales this year and making sure that your business does not get lost in the crowd. Our eye-catching graphics will make an impact on your customers, guaranteed. 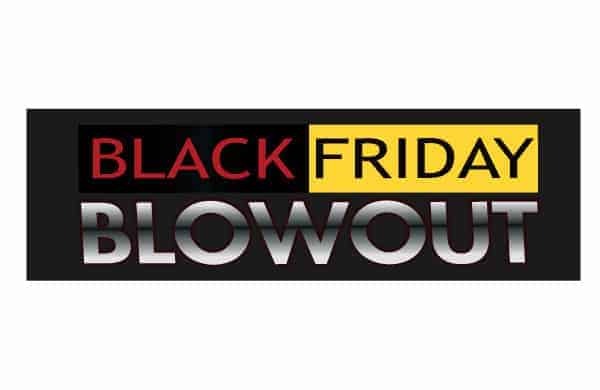 The Black Friday Blowout banners are perfect for drawing attention to your store this Black Friday Weekend. Make sure all of your customers know that your store is holding a sales event with your lowest deals of the entire year! 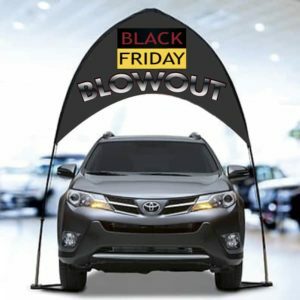 Our Black Friday Blowout Arch Banner Kit is another wonderful way to highlight a specific item or display piece. Buy our standard design or customize your banner kit for a specific product or company. The kit Includes a 4-piece pole set with a carrying case, the arch banner, and two tire bases. Don’t let time run out, order your Black Friday Sales decorations online today! Order Our Black Friday Weekend Promotional Package Online Now! Stay Ahead of the Curve for Black Friday Weekend! It’s never too early, order your Black Friday Weekend Sale banners, hang tags, and our Black Friday Promotional Package online now! Start preparing for the biggest sales event of the entire year and stay ahead of the curve. 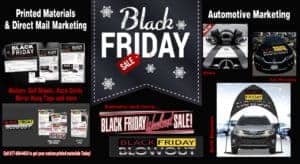 Customers will be flocking to your retail store or car dealership on Black Friday when you use our banners, posters, and hang tags to help promote your giant sales event. Our graphics are high-quality and feature bold red and white lettering in order to make the biggest impact. 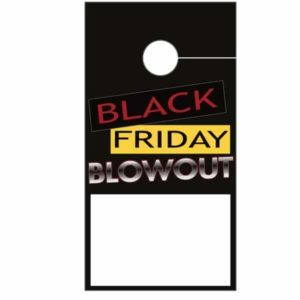 Black Friday themed banners, posters, and hang tags will help catch your customer’s attention keep the crowds flowing in. Use our striking Black Friday decorations to give your store some extra flare during the biggest sales event of the year! Order our Black Friday Promotional Package online today. Our guaranteed low prices are a bargain! Start your car dealership’s August off right with a seasonal sales promotion! 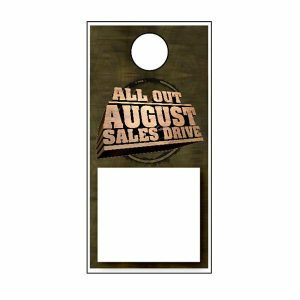 Our All Out August Hang Tags are perfect to advertise for the occasion. 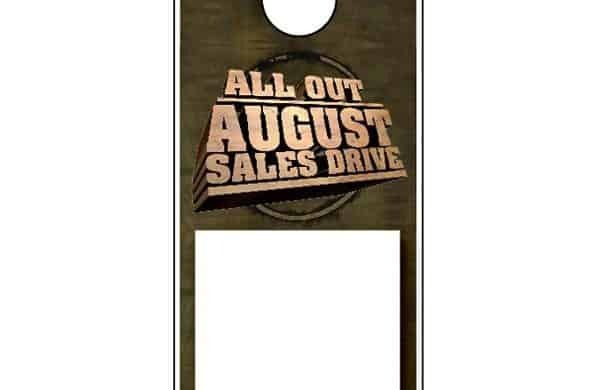 The All Out August Hang Tags feature high impact graphics and come in a package that contains 50 hang tags. Our themed and detailed hang tags will add the perfect finishing touch to your showroom display vehicles. Hurry, August only has 31 days in the month! Order your package of 50 hang tags online now before time runs out. Are you looking for a way to beat the heat and increase your car sales this summer? Our summer themed banners are the perfect opportunity to hold a summer promotional event at your dealership. If you want to make a splash with your decorations, you need to check out our Summer Beach Party Vinyl Banner! Our vibrant and festive banners make the perfect addition to any summer sales event promotion. 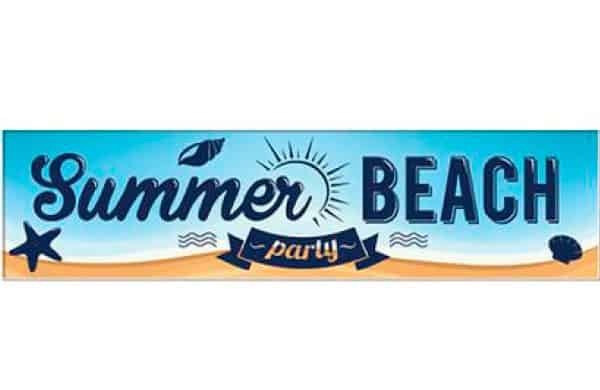 The Summer Beach Party Vinyl Banner features beach themed graphics and vibrant colors that represent the ocean and sand! Our premium-quality graphics and designs will be sure to turn heads and draw in crowds to your dealership or retail store. Hurry, and order now before the summer season comes and goes. Don’t forget your sunscreen! Fourth of July is nearly here! Order your decorations today so that your items ship out just in time to decorate your car dealer showroom! Give your customers enough time to enjoy our stunning banners and graphics and show off your red, white, and blue spirit. Our clip-on flags, banners, and hang tags are perfect for the occasion. Your customers will love them. Our red, white, and blue balloon kit also adds the perfect finishing touch to your outdoor display. 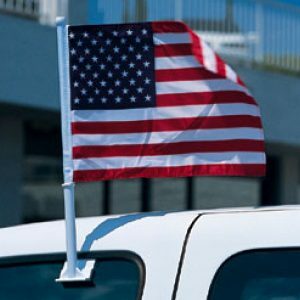 We recommend ordering our Fourth of July Promotional Package if you want a little bit of everything (includes posters, hang tags, balloons, and a large vinyl banner) to give your car dealership some holiday flair! It’s not too late to receive your items in time for the Fourth of July, but ONLY IF YOU ORDER NOW!